France is known for cycling, hosting the famous – and now infamous – Tour de France bike race each summer. In 1968 Peugeot jumped on board the notion of a Tour de France and promoted a trip by vélometeur (or moped) through various departments of the country. 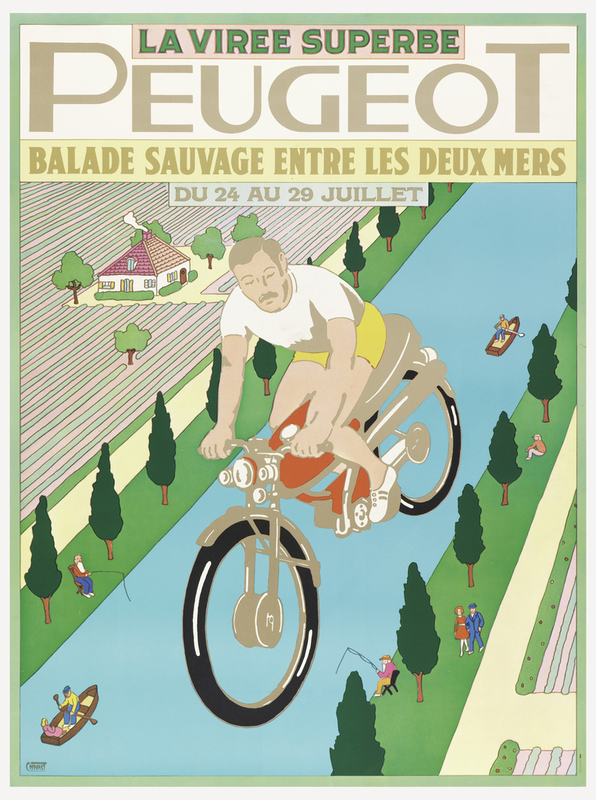 One section, pictured in this poster by American graphic designer Seymour Chwast, features a man on a Peugeot BB3 (an under-50cc scooter with the appearance of a motorcycle and safety of a bicycle) traversing the Canal du Centre in Saône-et-Loire. Chwast (born 1931) stands as one of the most influential graphic artists of the twentieth century, recognized for his playful and expressive approach to design that broke with the tradition of Swiss formalism. Chwast studied illustration and graphic design at New York’s Cooper Union before co-founding the celebrated Push Pin Studios with fellow graduates Milton Glaser, Edward Sorel, and Reynold Ruffins in 1954. Chwast believed concept to be as important to design as illustration and irony and humor percolated his commercial work. He used visual tricks and puns to play on images and words, effortlessly manipulating the everyday into the unexpected with subtlety and acuity. Chwast’s poster for Peugeot’s tour through Saône-et-Loire ironically used the title balade sauvage entre les deux mers (a wild ride between two seas) to describe a trip that would be anything but ‘wild’ in the ‘uncultivated’ and ‘uninhabited’ sense of the word; rather, it may be wild in the ‘enthusiastic’ meaning of the word. The Canal du Centre is a 70-mile canal with 61 locks that connect waterways stretching from the Atlantic Ocean and Mediterranean Sea and it meanders past colorful towns, flourishing vineyards, grazing cattle, and old industrial monuments. Chwast visually plays with the diagonal blue strip in the poster interpreting it as being both a waterway and a cycle-way and thereby implying the leisurely cruising speed of the Peugeot BB3. La virée superbe! Steven Heller, “Design Exhibition of Seymour Chwast,” NLB, accessed at http://www.nlb.si/design-exhibition-of-seymour-chwast. Rebecca Gross is a design historian and freelance researcher and writer based in Sydney, Australia. She has a Master’s in the History of Decorative Arts and Design from Parsons The New School for Design / Cooper Hewitt, Smithsonian Design Museum, New York.